Support anti-fascists in the North East: Get yourself to Shotton this Saturday! 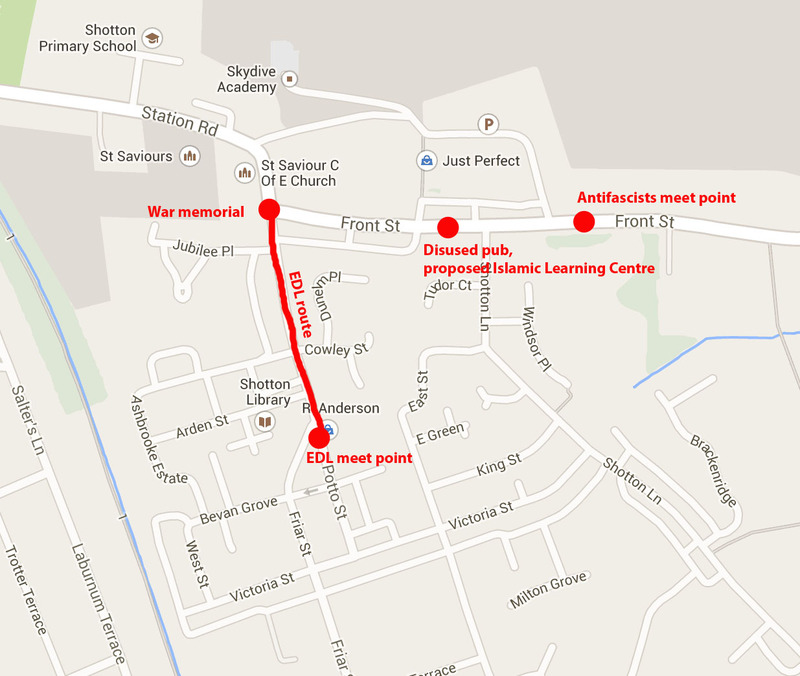 North East Anti-Fascists have been organising to oppose the EDL and North East Infidels in Shotton on Saturday. They have been working together with the Durham Miners Association and co-ordinating with local UAF to get numbers out on the day. People have been leafletting in Shotton and in other areas in the North East with the leaflet below and transport has been organised. 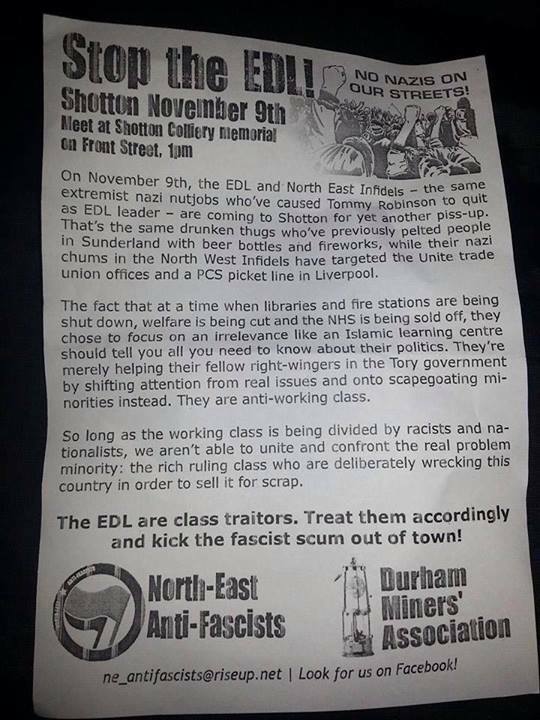 North East Anti-Fascists will be running a large bus to Shotton on November 9th. They encourage supporters who are travelling up or down the East Coast mainline to get to Newcastle. Costs for the bus will be kept at zero for those travelling some distance to get to the North East. Local activists will have to pay something like £1 unwaged and £4 waged for the return journey – this is a first come first served deposit payment. Contact North East Anti-Fascists for further details. Alternatively contact your local anti-fascist group to see if you can hook up with anyone else travelling to Shotton. 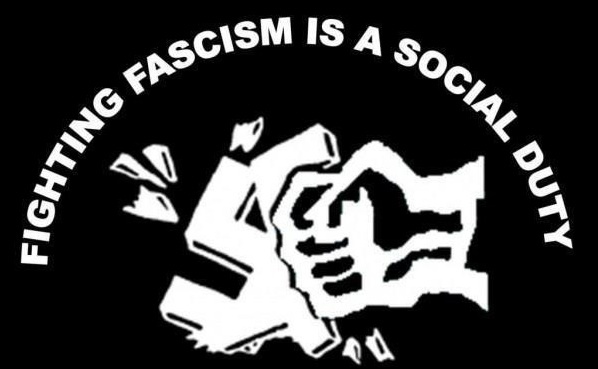 It is very important to support anti-fascists in the North East – they have a lot on their plate with both local EDL and Infidels groups and quite a high level of far-right activity. 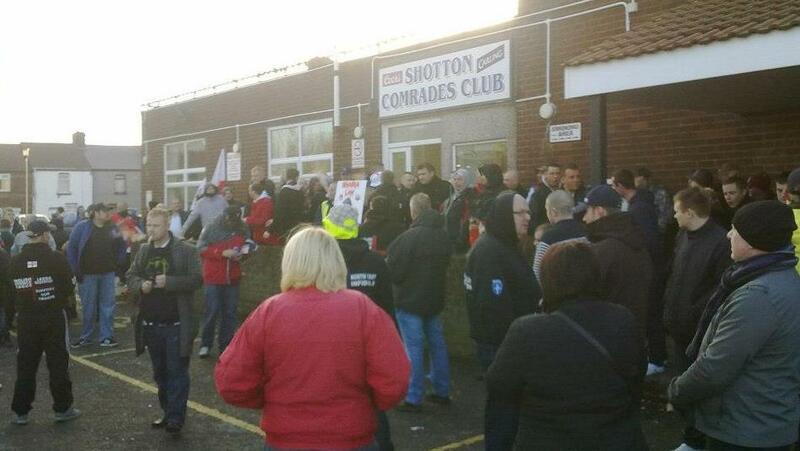 Shotton has clearly shown its disapproval of the EDL/NEI: both the Comrades Club and the Shotton Colliery Officials Club have refused to host the racists on Saturday partially due to the actions of the many people who have called to express their concerns. The famous Blackhall colliery socialism banner is on its way to Shotton on Saturday for the anti-fascist protest. A counter mobilisation has also been organised under the banner of ‘Durham County Unites Against Racism’ meeting at the same time and place. Their mobilisation is supported by the local MP, various trade unions, Durham People’s Assembly and Tyne and Wear Anti-Fascist Association. They have organised transport from Durham, Newcastle and Sunderland. Contact them for details. They also say safe parking will be available in the adjacent industrial estate. The EDL were planning to assemble at the Comrades Club from 11.00 until the Club refused to host them. Having lost all their options for pre-demo drinking they are planning to meet on the green at Potto Street at 1.30, but may potentially be gathering in the town from earlier. From the green they plan to walk to the war memorial and then to the ‘demo point’ for speakers etc. On November 9th, the EDL and North East Infidels – the same extremist nazi nutjobs who’ve caused Tommy Robinson to quit as EDL leader – are coming to Shotton for yet another piss-up. That’s the same drunken thugs who’ve previously pelted people in Sunderland with beer bottles and fireworks, while their nazi chums in the North West Infidels have targeted the Unite trade union offices and a PCS picket line in Liverpool. The fact that at a time when libraries and fire stations are being shut down, welfare is being cut and the NHS is being sold off, they chose to focus on an irrelevance like an Islamic learning centre should tell you all you need to know about their politics. They’re merely helping their fellow right-wingers in the Tory government by shifting attention from real issues and onto scapegoating minorities instead. They are anti-working class. So long as the working class is being divided by racists and nationalists, we aren’t able to unite and confront the real problem minority: the rich ruling class who are deliberately wrecking this country in order to sell it for scrap. – Also see this charming account of the organiser of the EDL protest, Anthony Smith, jailed for ‘Muzzy bashing’ attack on Asian-run businesses in Shotton.